Published on April 12, 2016 by Martyn. Be the first to comment! 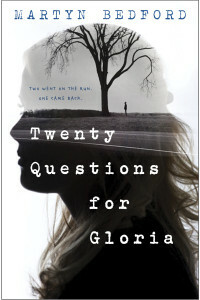 It’s publication day for Twenty Questions for Gloria in the United States! Two months after my new YA novel came out in the UK, the American edition – published by Wendy Lamb Books, an imprint of Penguin-Random House in New York – has hit the bookshops, virtual or otherwise, on the other side of the Atlantic. “Taut and mysterious…Bedford’s skilful writing and unusual format will draw in teens who identify with the urge to cast off the mundane and find their place in the world.” – Booklist. “Dropping clues with absolute control over the novel’s trajectory, Bedford builds tension from the initial interview to the surprising final scene.” – The Horn Book.